Leah and I were Brownies for about two weeks when we were little, and that has been the limit of our Girl Scouting experience. This does not mean we haven’t purchased an overpriced box or two of Girl Scout cookies now and then subsequently. I’ve spent far too much money on them and to be honest, the more I improve at cooking and baking, the less good pre-packaged stuff tastes (although I’m never one to say no when someone offers me a Girl Scout cookie! They are pretty yummy.). The other day at yearbook, when a classic green box of Thin Mints was placed on the front table, I decided that enough was enough. Time to recreate a Girl Scout cookie at home. I researched some recipes, but none sounded quite reputable (some suggested stirring mint extract into chocolate, which can cause it to seize up. Not a risk I was willing to take!). I wanted a crisp cookie with lots of chocolate flavor and the perfect quantity of mint. Instead, I turned to a couple of favorite food blogs and found a recipe for a homemade Oreo cookie. 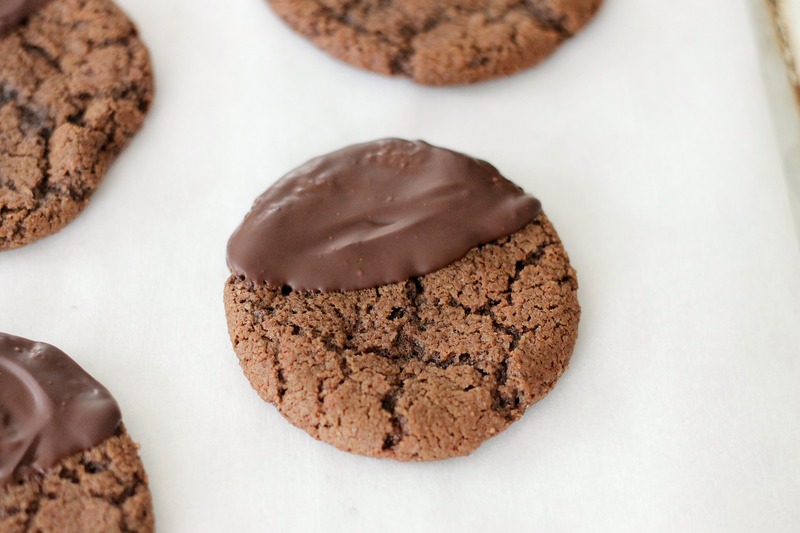 This recipe sounded perfect because if you think about it, the cookie inside the chocolate shell of a Thin Mint is very similar to that of an Oreo. We just added some peppermint extract to the cookie dough, and the cookies turned out perfectly. They had just the right amount of minty flavor and were both crispy and chocolatey. We dipped only half of the cookie sides in the chocolate, since we felt that having the whole cookie covered in dark chocolate was too much. We also didn’t add peppermint oil to the chocolate, since the cookies were minty enough. All in all, these cookies turned out perfectly! They were way better than the originals and cost far less. Combine all the ingredients except for the egg, butter, and extract in the bowl of a stand mixer. Combine briefly until evenly mixed. Beat in butter, then egg and extract. Place generous teaspoon-sized balls of dough on the baking sheet and press down a bit. Bake until set and crackled, about 9-10 minutes (don’t underbake, because you want these to be crispy, but be careful not to overbake- since these cookies are naturally dark, it is easy to not notice if they are burning a bit at the edges). Remove to a cooling rack and let cool completely. Melt the chocolate in a double boiler. If it’s too thick, stir in a bit of neutral vegetable oil. 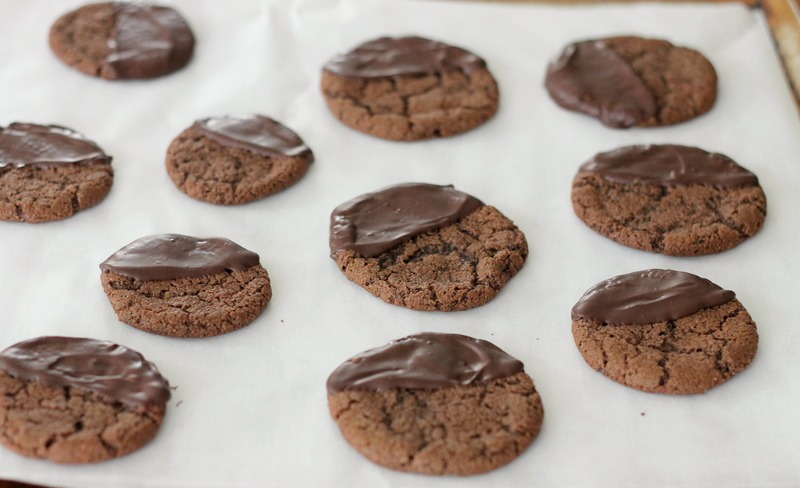 Dip the cookies as desired in the chocolate and place on a piece of parchment or waxed paper to set completely. Serve and enjoy! These will keep in a plastic container for at least a couple days. I will definitely try this recipe. – after we finish the 8 boxes of thin mints we ordered!! That’s a lot of thin mints! I know that at least in our house, they would go quickly though. Enjoy the recipe if you make it!